Great Morning Work to help get your students settled into the day! Grab this morning work HERE! ***NOW AVAILABLE in Morning Work Through the Year (January-December) providing an 18% SAVINGS (2 months FREE) rather than purchasing each individual pack. This product is NOW AVAILABLE in a Bundle. Purchasing the Bundle provides an 11% SAVINGS rather than purchasing each individual pack. This 20 page common core packet contains language arts and math material for the month of March. 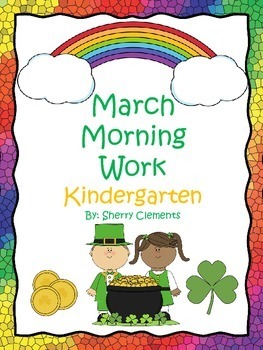 Most pages have March graphics such as clovers, shamrocks, coins, pots of gold, leprechaun, kites, lions, and lambs. The skills included are skills that students would be learning during the last half of their kindergarten year. The preview shows each page included. Please take a look. -Tracing word wall words (sight words): eat, all, come, what, good. -Tracing a sentence with each sight word included above. -Writing a sentence for each of the sight words above. -Writing a sentence about a March picture. -Circle the correct word for each CVC picture. -Circle the pictures with the correct short vowel sounds. -Rewrite the sentences correctly with capital letters and correct ending punctuation. -Counting double ten frames (11-20) and writing the correct number. -Count the objects and write the sum. -Complete the number bonds 1-5. This common core packet is great for morning work, but can also be used for homework, literacy centers, writing centers, math centers, or a mini lesson. I hope you and your students enjoy using this packet.